and sophisticated Manor House. Renowned architect Italo Lupini, has put his expertise and passion together to create a trend setting residential masterpiece. Lush palms, pin oaks, liquid Amber trees and a rich array of indigenous flora define this majestic parameter. In addition, each apartment has a generous covered patio, which allows for all year round al-fresco dining and lounging. Therefore, allowing residents to take advantage of the enjoyable Highveld climate. Manor House is equipped with state-of-the-art security. The saturation perimeter and sight camera surveillance protects you and your family at all times. Italo has cleverly fused modern, lock-up-and-go city living with colonial aristocracy. 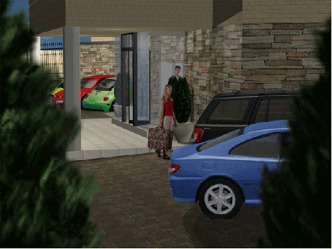 The purpose built parking area with double security gates, gives remote and control access to both the concierge and apartment owners. Manor House comprises 8 unique luxury apartments that blend both modest colonial and state-of-the-art modern living into one. The three floors house three apartments per floor, served by an elevator. The basement provides secure parking with three bays per unit. There is also ample visitor’s parking. The secluded residents’ clubhouse with its sparkling pool, magnificent bronze mermaid and beautiful landscaped area is the perfect place to entertain family and friends. The designer porte-cochére entrance greets you with an artistic water feature as bronze herons cast a watchful eye over the majestic Koi fish. You will find that the ergonomically designed kitchen by New Design is extremely user friendly and is equipped with the latest exclusive AEG appliances. All of this is complimented with the finest granite tops. The spacious covered balcony with built-in barbecue in the three-bedroomed units with distinctive stone masonry chimneys, provides the feel of yesteryear and is the signature and focal point of the Manor House. It makes for a great place to kick back, relax and enjoy the South African weather. The three-bedroomed apartments feature a guest or housekeeper suite appointed with the same luxurious finishes with easy access to the kitchen, scullery and courtyard. Charming Juliet-style balconies off each main bedroom allow for a romantic and intimate ambient experience. The opulent bathrooms house top brands such as Geberit wall-mounted flushing systems; Hans Grohe taps and mixers and sandblasted architectural shower doors by Aluview. The designers of the Arabella Sheraton Hotel on the Victoria and Alfred Waterfront ensure that the Manor House bathroom is the ideal place to relax and pamper oneself. The living rooms are both elegant, yet functional with an atmosphere of comfort and relaxation. The state-of-the-art Bang & Olufsen TV/DVD piped sound system could be installed to provide you the best quality for your entertainment pleasure.